Flutes & Pearls is a reproduction and adaptation of an 1821 candlestick base design by Mr. Karl Friedrich Schinkel, sculpted by Ms. Nancy VanDerMolen. In decorative arts references, "Flutes" are sculpted parallel indentations and "Pearls" are repeated raised beads. Slightly more formal than many of the other patterns by Wilton Armetale, the classically sculpted effect is adaptable to accessorize a wide variety of Classical home decorations and dinnerware patterns. Its refined Classical elegance is unparalleled in todays casual environment. 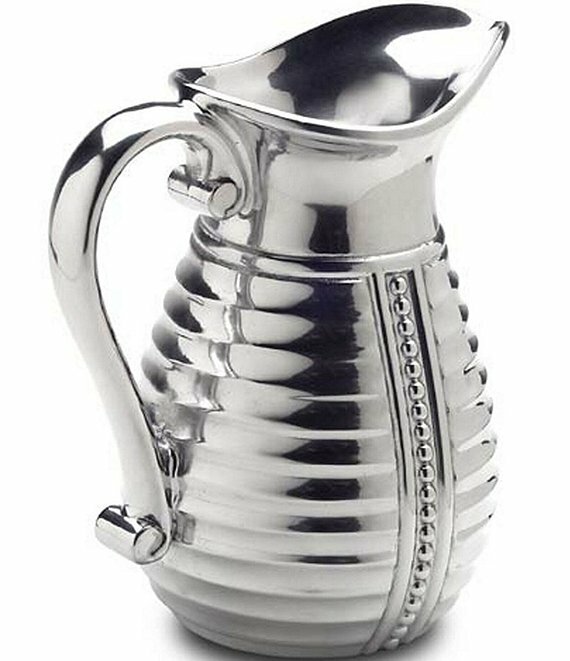 This pitcher measures 8 x 8.75"H.
As substantial as they are beautiful, Wilton Armetale pieces are ideal for any occasion. Each piece is made from 100% recycled materials and is designed to last a lifetime; they will not break, crack, chip, rust or tarnish under normal use. Every piece can be used on the stovetop or grill, in the oven or directly from the freezer to the table. Manufacturer's limited lifetime warranty.